Spending time visiting the world’s most famous reef could also help preserve its beauty for generations to come. The Great Barrier Reef is home to over 600 types of coral,1625 species of fish and six out of the seven species of turtle in the world. Spanning a staggering 1430 miles along Queensland’s world-famous shoreline, the UNESCO World Heritage-listed marvel that is the Great Barrier Reef is home to 2900 individual reefs, 300 coral cays and 600 continental islands, all of which provide a home for some 1625 species of fish and over 600 types of coral. In fact, it is the largest living thing on Earth, and covering 134,634 square miles, it’s roughly half the size of Texas. As natural wonders go, they don’t come much more impressive. But its sheer size and scope can leave visitors scratching their heads when it comes to determining where to go and what to see. 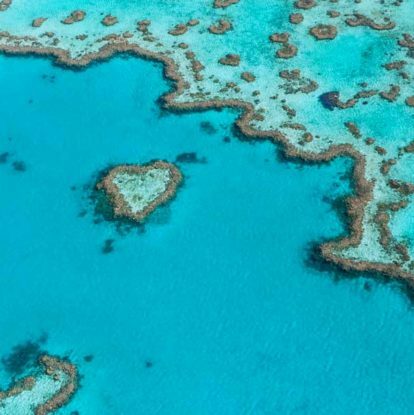 Don’t make the mistake of thinking the islands and reefs that make up this stunning constellation are interchangeable; the Great Barrier Reef offers travelers five different regions to explore, and myriad options to enjoy them. Following, some essential reef reconnaissance to help you decide what will work best for you. The wild north around Cape York in Tropical North Queensland (basically the pointy bit at the top of Australia) is blissfully unspoiled, making it the perfect holiday destination for intrepid marine adventurers in particular. Base yourself in the charmingly laid-back coastal town of Cooktown and venture out onto the reef to snorkel and dive, or you can keep your feet dry by opting for a glass-bottom boat tour. There is a range of accommodation options in the region, especially in and around Cooktown, or you can opt for serious luxury on Lizard Island, Australia’s northernmost island resort. Further south, Cairns and Port Douglas (just over two hours’ flying time from Brisbane) offer up myriad reef experiences – from snorkeling and dive courses to overnight cruises and glass-bottom boat and semi-submersible submarine tours – with the added bonus of being able to explore the lush tropical Daintree Rainforest, the oldest rainforest in the world and another UNESCO World Heritage site, while you are there. It takes roughly 35 minutes to reach the reef itself from both locations, which are well equipped with fabulous food and stylish accommodation choices. Boasting up to 300 days of sunshine a year, Townsville is located roughly in the middle of the reef and presents a standout vacation option thanks largely to its lovely historic buildings, its dive-worthy shipwrecks, as well as its tropical pace of life. Along with snorkeling and diving, there’s ample opportunity for fishing expeditions and even horseback riding along wide beaches. There are also some great islands to visit along this stretch of the reef, including Magnetic Island, home to a thriving population of koalas, so sightings are all but guaranteed, and the exclusive Orpheus Island, which boasts luxuriously appointed rooms at Orpheus Island Lodge as well as a marine research station. The Whitsundays are home to some of the reef’s most scenic (and well-known) islands, including holiday hot spots like Hamilton Island, Hayman Island (reopening July 2019) and Daydream Island. Cruising around this patch of paradise, which has some 74 islands, is easy thanks to plentiful charter companies (opt for a crewed service so everything is taken care of for you) and day tour options, set forth from either Hamilton Island or the town of Airlie Beach on the mainland. Most tours take in Whitehaven Beach; its impossibly white sands have earned it a reputation as one of the best beaches in the world. The Great Barrier Reef is alive with a colorful array of marine life. Head to the Southern Great Barrier Reef for stunning islands and laid-back coastal towns like Bundaberg (a one-hour flight from Brisbane) and Agnes Waters, and a staggering population of marine turtles. On Lady Musgrave Island, a coral cay with some 1200 hectares of living reef, you can watch green turtle hatchlings scurrying down the beach from January to May, and Lady Elliot Island is known for its world-class snorkeling and diving experiences. Enhance your experience, and make a real difference to the reef’s future, by signing up to one of these eco-friendly, citizen science projects. Sign up with organizations such as Eco Barge Clean or Tangaroa Blue to help out with beach clean-ups or assist with any marine debris trips. Take part in a reef monitoring program such as Eye on the Reef or Reef Check and help researchers collect valuable information about reef health, marine animals and incidents. All you have to do is swim, snorkel or dive and download an app which allows you to submit GPS-tagged photographs of wildlife, pollution, coral bleaching and pests to the appropriate authorities. If you snap a photo of an unidentified manta ray, you’ll get to name it! Snap photos of any manta rays you come across as you enjoy the reef and share them with Project Manta so researchers can better understand the rays’ movements, distribution and growth rates. If you identify a new manta ray, you’ll also score naming rights. Spend a little time volunteering at Bundaberg’s Mon Repos Turtle Centre, home to six of the world’s seven species of marine turtles, or help look after sick or injured marine turtles at Fitzroy Island’s Turtle Rescue and Rehabilitation. Not only is it a great experience, but you’ll come away from your trip feeling like you’ve made a positive difference in the world. It isn’t exactly a newsflash to say the Great Barrier Reef is in trouble. In recent times, an increase in coastal development, coral-destroying pests like the crown of thorns starfish and significant episodes of coral bleaching – a direct result of climate change – have placed the reef in a state of serious vulnerability. So, if you are considering a visit (some two million visitors flock to the Reef each year) it is worth doing your research and finding operators who approach the reef in a responsible way. Orpheus Island is a perfect example of how tourism can educate and benefit. The luxury island retreat hosts just 28 visitors at a time, with $50 per guest’s stay contributed to The Reef Keepers Fund, which supports projects and organizations that are committed to protecting the Great Barrier Reef. It is also home to the Orpheus Island Research Station, a marine research facility operated by James Cook University; eco-tours explore the facilities, including the wet and dry laboratories and the live reef touch tanks. There are regular direct and connecting flights into Cairns, Hamilton Island, Proserpine or Townsville Airports from all Australian capital cities. Looking at staying at an island resort in the Whitsundays? The gateway mainland town for most of them is Airlie Beach, located a 25-minute shuttle bus ride from Proserpine Airport. Whether you prefer a luxurious private resort or pitching a tent on a deserted beach, accommodation options are aplenty at every price point. At the higher end of the scale, Hayman Island by InterContinental includes a much-adored kids’ club among its lengthy list of activities, while Hamilton Island Yacht Club Villas offers chic residences for those who desire both space and all the mod-cons. There are two members of the prestigious Luxury Lodges of Australia on the Great Barrier Reef. On Hamilton Island qualia is a private villa complex (they call them pavilions) and has taken out several global awards, including Condé Nast Traveler‘s Best Resort in the World. On the far north of the reef, Lizard Island remains the only resort where one can walk out of your room, stroll down to the beach and swim out over the reef. Mid-range, the Sheraton Grand Mirage Port Douglas is a popular choice with couples and families, while camping at Lady Musgrave Island or Fitzroy Islands (among others) will cost next to nothing yet deliver a deserted-island experience that you’re not likely to forget in a hurry. Whether you’re keen to explore the outer reef or simply stay on dry land, you can choose your own adventure. Consider relaxing in the coastal town of Airlie Beach, taking a snorkeling tour with Quicksilver Cruises, or checking out the native koala population of Magnetic Island. You can also appreciate it all from above with Down Under Cruise & Dive, which takes you out for snorkeling and diving, as well as a helicopter ride from Hastings Reef. There’s also the scenic helicopter flight over romantic Heart Reef, or you could hire a yacht and sail, snorkel and dive the Whitsundays. Be the first to experience a new era of luxury travel in the heart of the Great Barrier Reef. Celebrate the opening of InterContinental Hayman Island Resort from the 1st of July with up to 25% off your stay for a limited time. Conditions Apply.